← Losing My [“I’m Alive with Clive” T-shirt’s] Virginity! 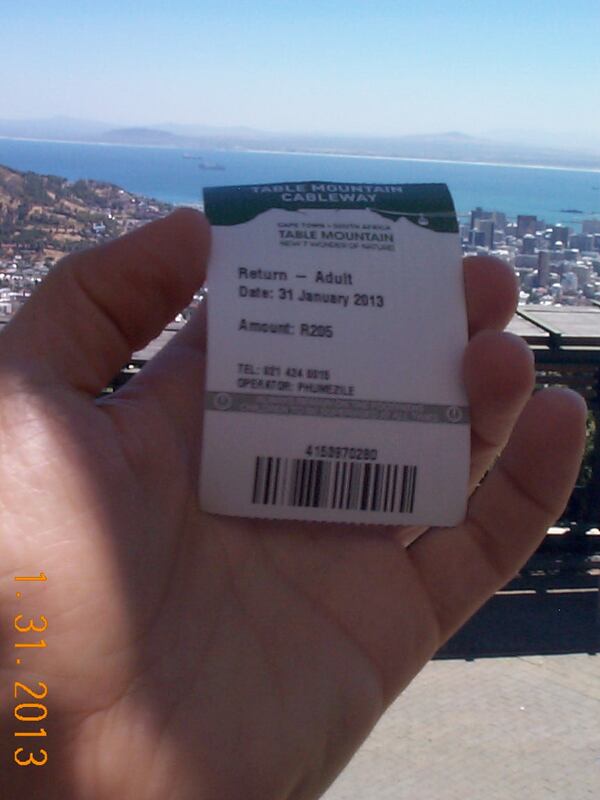 On January 31, 2013, during a recent trip to Cape Town, the city in which I spent the first 26 years of my life, I did what 800,000 tourists to Cape Town do every year: I took a cable car ride up to the top of Table Mountain. 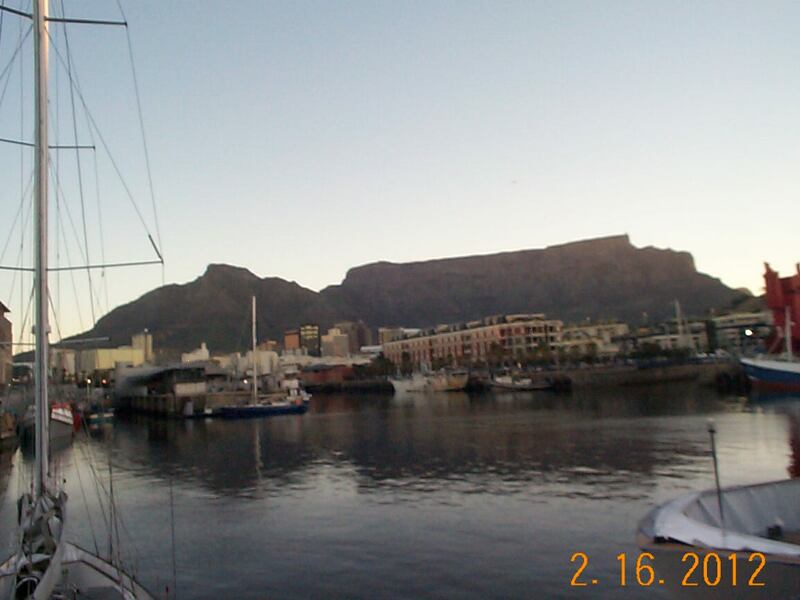 Here’s a picture of Table Mountain I took from Cape Town’s V&A Waterfront when I was there in February 2012.
in May 2012, after a campaign that attracted more than 100 million global votes, it was confirmed that Table Mountain became one of the New 7 Wonders of Nature! Table Mountain forms the backdrop to the center of Cape Town itself, and gives the city its charm and character. On days when the feisty south-easter is blowing, a white cloud can be seen to form a tablecloth over the mountain — a remarkable sight to behold! 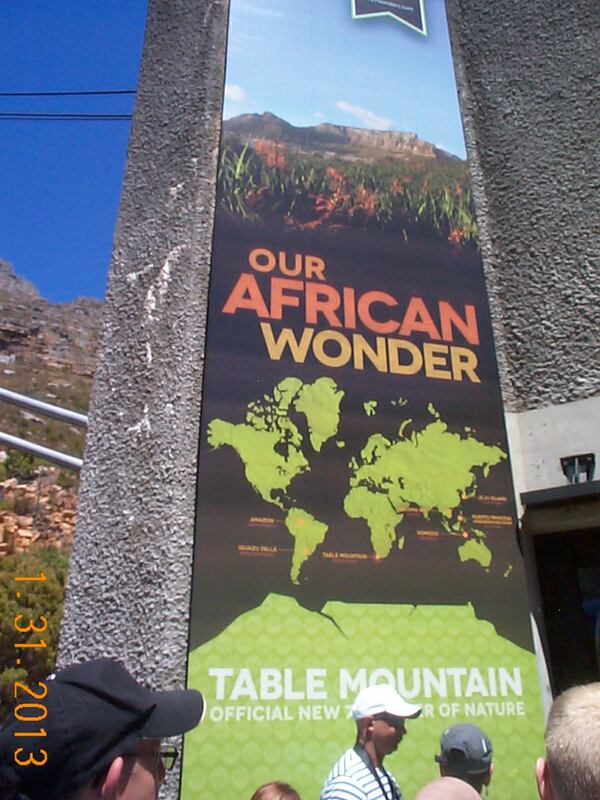 It’s been reported that Table Mountain is approximately 260 million years old. By comparison, the Andes are about 250 million years old, the Rockies are about 60 million, the Himalayas are 40 million and the Alps are 32 million years old. 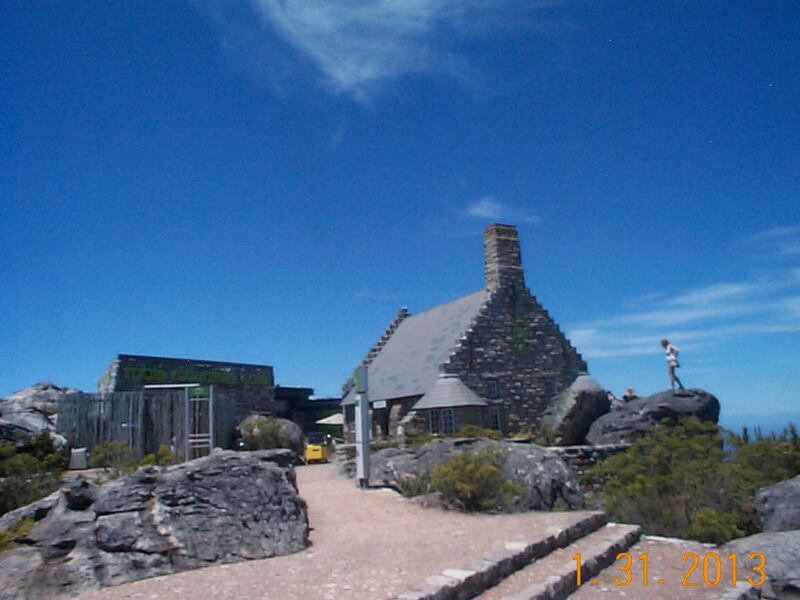 The highest point of Table Mountain is 1,085m (3,559ft), marked by Maclear’s Beacon. A large stone cairn – built by Sir Thomas Maclear in 1844 – marks the exact spot. 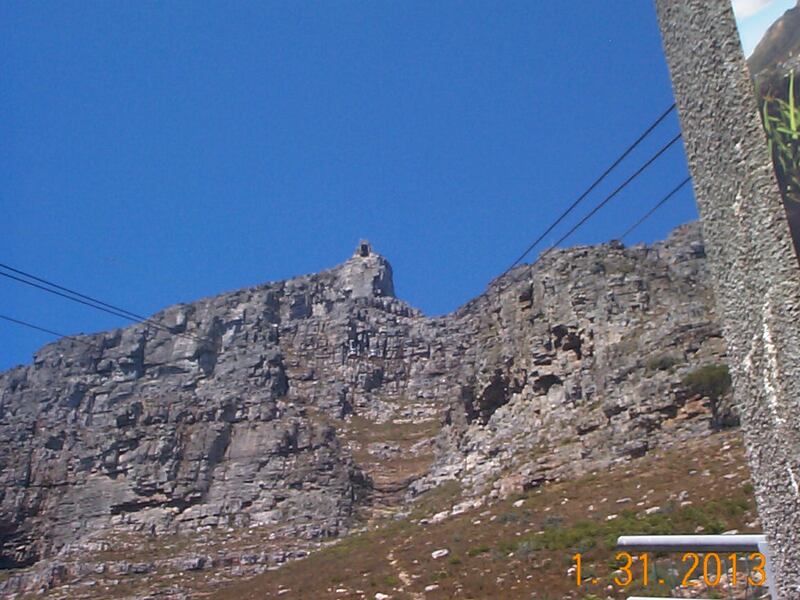 The Cableway has been in operation since 1929, and has a 100% safety record. The new cable cars, called Rotairs, which were introduced in 1997, were imported from Switzerland. These cable cars are in operation in only two other places in the world, Titlis in the Swiss Alps in Switzerland, and Palm Springs in America. 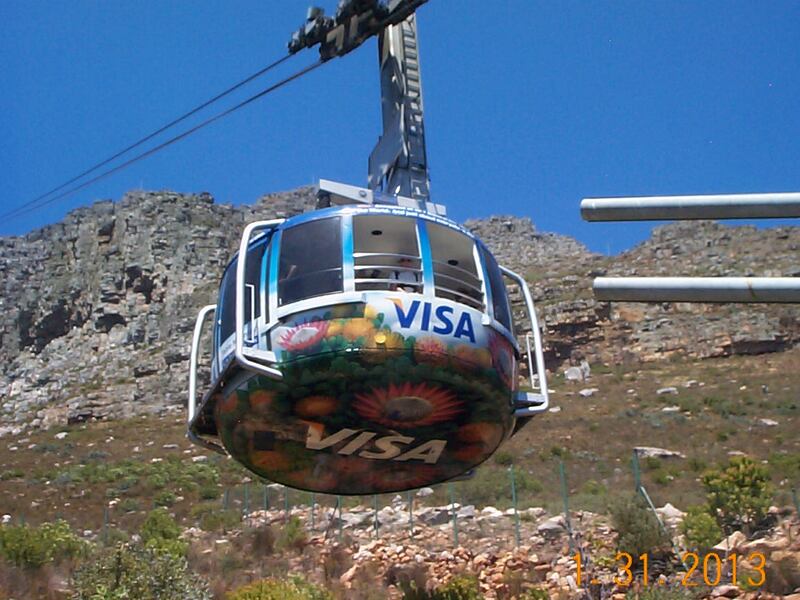 To date, the Cableway has transported more than 21 million visitors to the summit. The floor of each cable car rotates giving everyone a 360 degree view on the way up and down. There is room for 65 passengers on each cable car, it takes about 5 minutes to reach or return from the top of the mountain, and the cable cars travel at a speed of up to 10 meters per second. Famous personalities who have been up the Cableway include Oprah Winfrey, Sting, Steffi Graf, Arnold Schwarzenegger, Margaret Thatcher, Prince Andrew, Brooke Shields, Michael Buble, and Tina Turner. To read the fascinating history behind the introduction and current operation of the Cableway, click here. As you’ll see from pictures on this Web site, from the top of Table Mountain the vistas of the surrounding Cape peninsula are truly spectacular. It’s best to go up the Cableway on a clear day when the wind isn’t blowing. During my stay in Cape Town in January, the weather on many of the days was perfect for a ride up the Cableway, and I chose to make the trip on January 31. It shows the price for the round-trip ticket as R205 – less than $25. Tourists learn quickly that when the day dawns, if there are no clouds in the sky and the wind is not blowing, conditions are ideal for a trip up the Cableway. 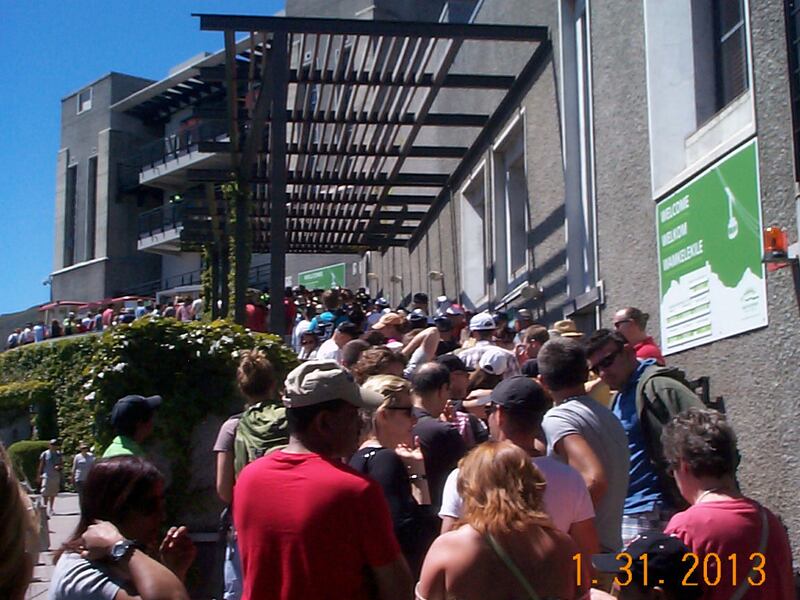 So at around 10 a.m. long lines begin to form to buy tickets and go up the mountain in the cable cars. I joined this line at about 11.10 a.m. after waiting in line for about ten minutes to buy my ticket, and waited about 50 minutes for my turn to go up the mountain in one of the cable cars. If you look closely, you’ll see I captured the two cable cars in the middle of their ascent and descent, at the exact moment they were passing each other. I went up to the top of the mountain on this excursion long enough to have some pictures taken, and noted that there is now a top-notch restaurant as well as a souvenir shop there. By the time I returned to the lower station at the foot of the mountain at around 12.45 p.m., there were no lines. The risk one takes of going later in the day, though, is that the wind could begin to blow, and you have less time to explore the top of the mountain before it gets colder at the top. I realized on this last trip to Cape Town more so than ever that while you can take me out of Cape Town, you can’t take Cape Town out of me. I highly recommend a visit to Cape Town and a trip up the Cableway, so that you experience this majestic New 7 Wonder of Nature yourself. As noted on the back of the Table Mountain Cableway Information Guide, though, a visit to Cape Town will not be complete without visiting the other five must-see destinations in the Cape Town Big Six: Cape Point, Groot Constantia, Kirstenbosch, Robben Island and the V&A Waterfront. . .
As well as Muizenberg, where the water in the ocean is warm, and . . .
My favorite beach in the world: Clifton Beach, which you can see from the top of Table Mountain. . . .
And so many other places there too. This entry was posted in Clive's Perspective and tagged 100% safety record, 65 passengers, African Wonder of Nature, Alps, Amazon Rain Forest, Andes, Argentina, Arnold Schwarzenegger, Brazil, Brooke Shields, cable cars, Cableway, Cape peninsula, Cape Point, Cape Town, Cape Town Big 6, Cape Town Harbor, Clifton, Clifton Beach, Global Community, Groot Constantia, Ha Long Bay, Himalayas, Iguazu Falls, Indonesia, January, Jeju Island, Kirstenbosch, Komodo, Maclear's Beacon, Margaret Thatcher, Michael Buble, Muizenberg, multiplying magnificence, New 7 Wonder of Nature, Official New 7 Wonder of Nature, Oprah Winfrey, Palm Springs, Philippines, Prince Andrew, Puerto Princesa, Puerto Princesa Underground River, restaurant, Robben Island, Rockies, Rotairs, Sir Thomas Maclear, South America, South Korea, south-easter, souvenir shop, Steffi Graf, Sting, Swiss Alps, Switzerland, Table Mountain, tablecloth, Tina Turner, Titlis, tourist destination, TV show, V&A Waterfront, Vietnam, wind blowing, Wonders of Nature. Bookmark the permalink.